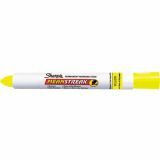 Marks on dark surfaces and write on most surfaces. 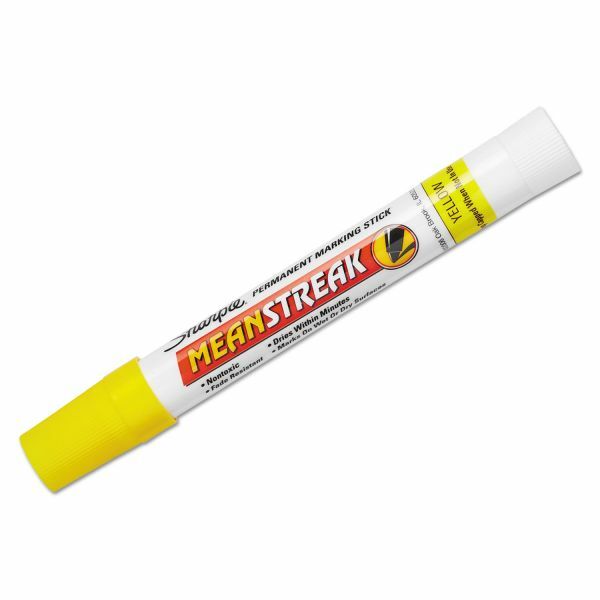 Specially formulated to mark on wet and oily surfaces. Quick-drying ink is waterproof, smearproof and fade-resistant. 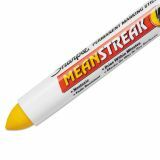 Easy-to-use, twist-up container makes marking easy. Note: A minimum quantity of 168 must be ordered, and in units of 12 thereafter. 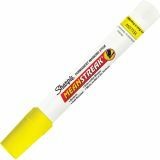 Sharpie Mean Streak Marking Stick, Broad Tip, Yellow - This permanent marking stick marks easily on wet and oily surfaces and is perfect for industrial use. Marking stick makes an opaque line on dark surfaces both indoor and outdoor and adheres to almost any surface. Ink dries permanently within minutes. Waterproof formula resists fading. Easy-to-use, twist-up container makes marking easy.